A religious leader, Ramesh Oza, delivers a spiritual discourse on the philosophy of Hinduism and moral values that one needs to practice in the society today. Lakshya TV is one of the leading Gujarati Spiritual Channels offering a variety of programs for the Spiritual audience in Gujarat. Rose to significance in the least amount of time, the channel overshadowed all the spiritual channels in its vicinity. 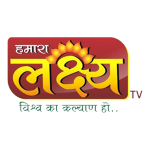 The channel features a vastly different range of programs from Supernatural to various social events like Bhajans, Katha, Pravachan, Kirtan etc. Lakshya holds an explosive mix of a wide variety of religious and spiritual guidance programs which make it appealing to all the audience. Apart from the Bhakti programs and the bhajans, the channel also serves some of the political agendas and the requirement of the nation to bring back the ancient Indian ideals like Saving cows etc. The channel stands for everything Hindu and is very much followed in Gujarat.